According to an article in Sunday's, Atlanta Journal-Constitution, retailers are expecting consumers to reduce their use of credit cards this holiday season. Most people plan to use cash for their holiday purchases. What? Is this a new concept? People actually be spending their own money for gifts this holiday season? Because of the credit crunch, more banks have cut back on credit card offers at the same time consumers are cutting back on purchases. In my opinion, if there is any good that will come out of the credit crunch, it is that people are starting to realize it is a bad idea to spend money that does not belong to them. If you don't have the ability to pay cash for a purchase, you probably should not be making the purchase; especially, if it is for a want and not a need. Credit card issuers have also started to get better about who they issue credit cards to. For the second quarter of 2008, compared with the second quarter of 2007, most of the top credit card issuers have reduced the number of credit card solicitations they send out. According to Synovate Mail Monitor, solicitations by HSBC are down 54%, Citigroup is down 45%, Discover is down 33%, Chase is down 9%, Bank of America is down 3%. Some issuers such as Washington Mutual and Capital One have actually increased the number of solicitations they've been sending out. How do you plan to pay for your holiday purchases? I always pay cash for everything or use my debit card. I agree that too many people spend like it's going out of style. Then a few months later they are selling their "stuff" for a mere fraction of what they paid. They wonder why they can't get ahead?! I actually buy gifts all year long. I save them in a closet that I named my gift closet. I know clever. This way if I have an unexpected gift, then I just go shopping in my closet. I save lots of money by shopping the clearance sales. I am buying all my christmas presents, and doing all my spending on credit cards. But like so many pay it off when the bill comes, how does that get accounted for in their numbers? We save up money every month through out the year to pay for Christmas. We'll be buying everything with cash, or if we buy something online we'll use a credit card but immediately pay the amount off before the bill even comes in the mail. 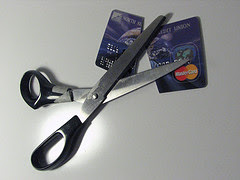 I will be using my credit card less this Holiday season - well, have been this whole year - not because I have a problem with credit cards, but just because I've cut spending in general. I actually never pay in cash and put all my purchases on a credit card to earn cash back or Amazon GC points, as well as to have record of where all my money has gone in the form of a credit card statement stored online. When you pay in cash, it can get hard to track where all the money has gone unless you personally record it and keep all your receipts. So any holiday spending I do will be on a credit card and will be paid off with money I have in the bank, but the total amount spent will be less than previous years.